In December USAF Staff Sergeant Lee Saari was granted emergency leave to return to the States to visit his grandfather who was very ill. While SSgt. Saari was home, a tragic fire completely destroyed the family home. While Lee, his wife Jessica and their children were not injured, they lost everything. To make matters worse, SSgt. Saari had to return to Okinawa, Japan almost immediately, with the heartbreaking burden of knowing his family was facing finding a new home at Christmas. 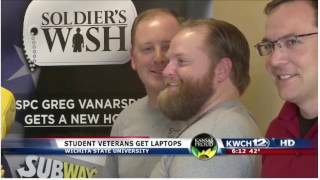 Soldier’s Wish and Subway stepped in to help this family. 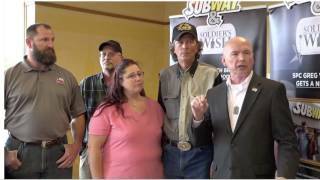 In less than a week after receiving the call, Soldier’s Wish met the family at Subway to present them the gifts of taking care of the utility deposits, as well as the deposit on their new home. Metro Appliances helped provide new appliances for their new home. By stepping up to help this family during one of the most difficult times of their lives, we have removed at least part of the heavy burden so that they can have a little peace of mind this Christmas Season.